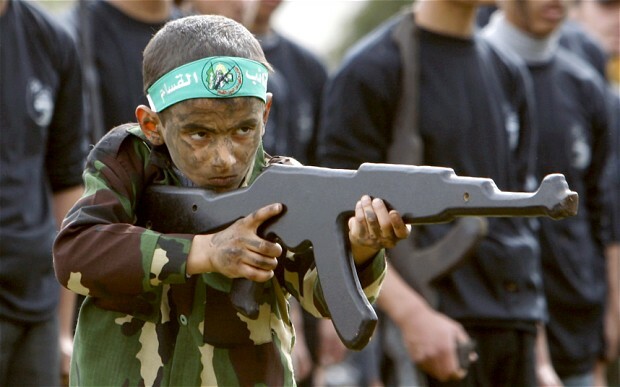 As such, it was encouraging to read a recent story by the Guardian’s Harriet Sherwood, entitled ‘Gaza schoolboys being trained to use Kalashnikovs‘, April 28, which reports on news that Hamas is now providing Gaza schools with military training for young boys. The program, which includes the use of firearms and explosives, will likely be extended to girls next year. Additionally, on the very same day that Sherwood filed her story, Phoebe Greenwood published a piece at The Telegraph entitled ‘Hamas teaches Palestinian schoolboys to how to fire Kalashnikovs’ – a report which is especially noteworthy in the context of a CiF Watch post back in 2011 which noted Greenwood’s skepticism over ‘claims’ made by Israeli officials regarding Palestinian incitement. Though both reports are problematic in many respects, and indeed ignore the broader problem of Palestinian incitement in both the West Bank and Gaza, it’s certainly a step in the right direction. Further, we can at least hope that Sherwood and Greenwood will follow-up on their stories and continue to inform their readers on the pathos within Palestinian political culture which inspires the constant vilification of Israel and dehumanization of Jews – a dynamic which makes most Israelis wary of the conventional wisdom which uncritically accepts that a two-state solution will necessarily result in peace. I suppose Sherwood and Greenwood are mature enough politically not using in their respective article the child soldier expression. It would be politically incorrect – they have to spare this word for everybody else and not in connection with the Guardian pet victims. The liberals that control the mainstream press and the BBC have hidden the truth from the world for many years. Most Islamic societies are deeply racist and intolerant, and the Arabs of the Middle East are no exception. The documented evidence is incontrovertible. However, western political correctness forbids mentioning it, and the UN, controlled by the Islamic bloc, simply ignores it. The Guardian, which has a special interest in the Middle East, must be singled out for special blame. They must be aware of Palestinian incitement and their vicious racist propaganda, but consistently refuse to inform their readers about it. So has the government. I haven’t looked at the Jerusalem page of the Foreign and Commonwealth Office’s site for years but I can’t imagine it has changed much. While it’s great to see an article like this appearing in The Guardian, don’t be under any illusions that this is anything to do with increasing understanding of Israel’s situation. Sherwood and Greenwood are simply playing their part in supporting Fatah’s current approach to attempts to discredit Hamas as the face of unacceptable pro Palestinian incitement, whilst remaining silent over Fatah’s less overt engagement in it via involvement of their own schoolchildren in compulsory praise of terrorism and suicide terrorism. They also mention but greatly downplay the significance of teaching these young men the art of IED manufacture and placement–a bit close to home, since it’s the main weapon in use against UK and NATO forces fighting the Taleban and Al Qaeda. And although they mention that it’s “schoolboys” who get the instruction, they don’t look into the analogues taught to the girls of Gaza under Hamas-controlled schooling. Oh, and don’t the schools that teach this stuff get rather a lot of funding from UNRWA? I think CiFWatch’s Bertolt Brecht should get busy on them. Yes, Peter? Any group that chooses savage behavior as the key element to that group’s core values deserves to end in a storm of violence, destruction and death from those to whom they would harm and their allies. What say you to letting the people back to their homes first, and only then working out what they owe you? Or are you terrified that you owe them $1 million each?